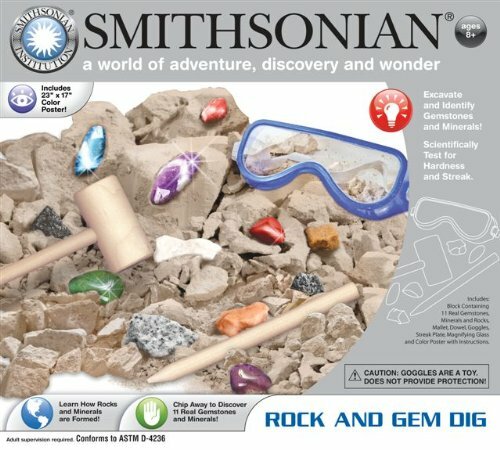 This Premium Science Dig Has It All!Dig into this Mega Gemstone Mine with the archeological tools provided and explore naturally formed crystals and gemstones from around the world. Unearth these gemstones and add them to your rock collection. 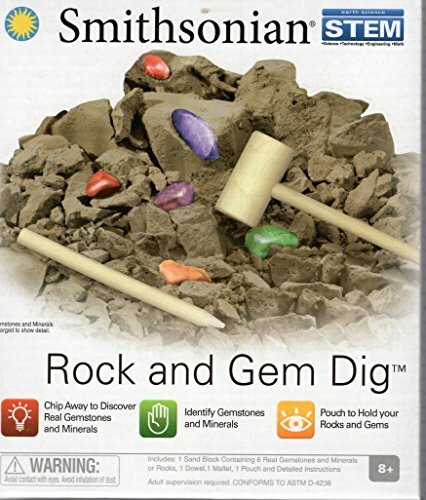 You’ll learn all about each stone and about how they are formed with the detailed learning guide included in this kit. 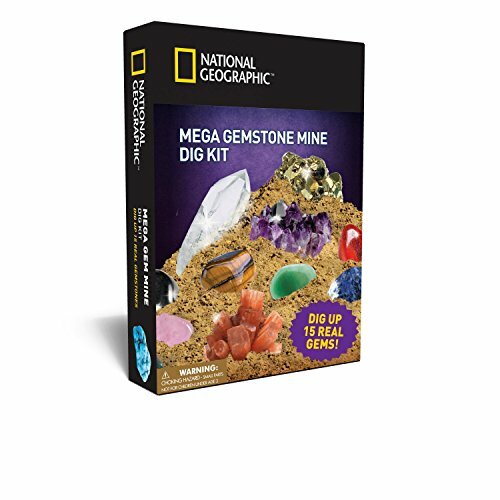 STEM science learning just doesn’t get any better!This science kit includes: Large dig brick containing 15 gemstones, full-color learning guide, archeological digging tools, and magnifying glass.Get the Mega Gemstone Mine today and join National Geographic as we inspire future generations with a passion for science and the wonders of the natural world.National Geographic Toys is proud to provide a 100% satisfaction guarantee with all our products so that you can buy with confidence.About the National Geographic SocietyWith a mission to inspire people to care about the planet, the 126-year-old National Geographic Society is one of the world’s largest nonprofit scientific and educational organizations.National Geographic’s net proceeds support vital exploration, conservation, research, and education programs. 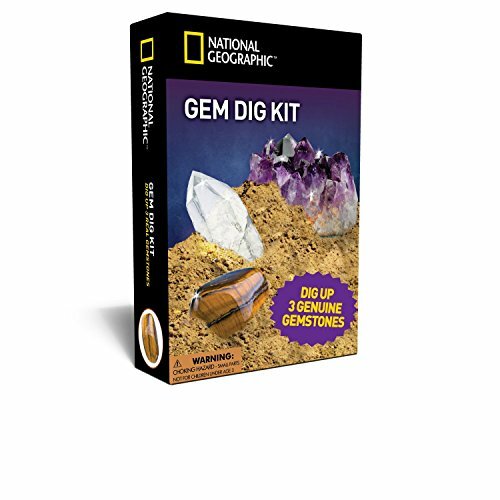 Dig Up Precious Stones and Start an Amazing Rock Collection!National Geographic’s Gemstone Dig is an exciting hands-on adventure that kids absolutely love! Your child will become a treasure hunter as they carefully uncover spectacular gemstones using the digging tools provided. National Geographic’s full-color learning guide makes identifying each specimen easy. The guide is also packed full of information and amazing facts about their crystals.This science kit includes: One digging brick containing 3 amazing gemstones (quartz, amethyst, and tiger’s eye), archeological digging tools, full-color learning guide, and magnifying glass.Get your National Geographic Gemstone Dig Kit today and spark a love of science in your child that will last a lifetime.National Geographic Toys is proud to provide a 100% satisfaction guarantee with all our products so that you can buy with confidence.About the National Geographic SocietyWith a mission to inspire people to care about the planet, the 126-year-old National Geographic Society is one of the world’s largest nonprofit scientific and educational organizations.National Geographic’s net proceeds support vital exploration, conservation, research, and education programs. Great fun for the young explorers! Excavate and discover hidden gems! 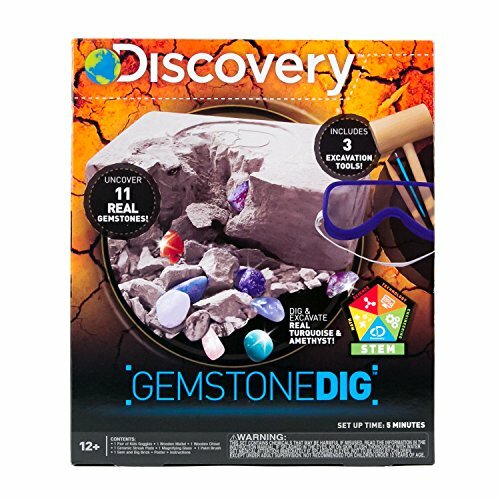 Channel your inner archaeologist with the Discovery Gemstone Dig! Put on the safety goggles and dig in to unearth 11 precious gemstones. As the stones are revealed, carefully chisel around them, brush away the debris and use the included magnifying glass to take a closer look at the patterns and colors within each gorgeous stone. Then, like a real archaeologist, use the ceramic streak plate to determine the color of the minerals in powered form. This is just the start to an amazing rock collection! Recommended for archeologists 12 years and up. 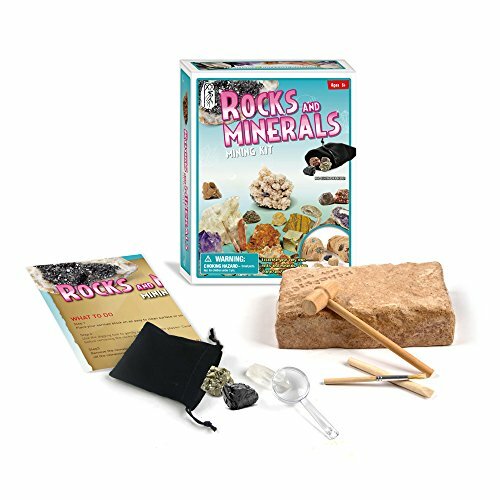 This science activity kit includes over 150 rocks and minerals, clean gravel (to simulate a real rock hunt! ), 2 easy-to-break crystal-filled geodes, fossilized shark teeth, arrowheads, and a color educational identification sheet. 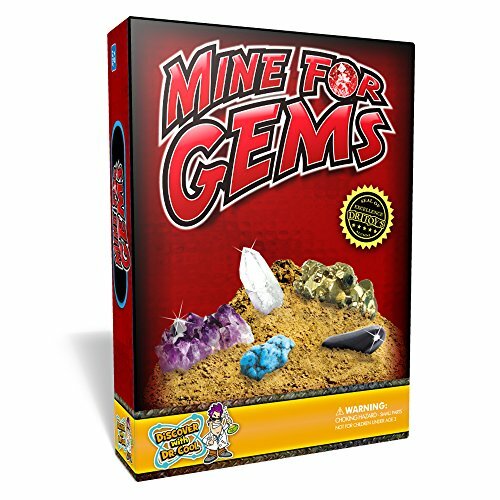 Teaches how to find, sort and identify rocks, gems, and minerals. Search for rock and mineral treasures and identify specimens with full-color identification sheet like a real rock hound! Most of the rock and minerals measure ½ to 1 inch. 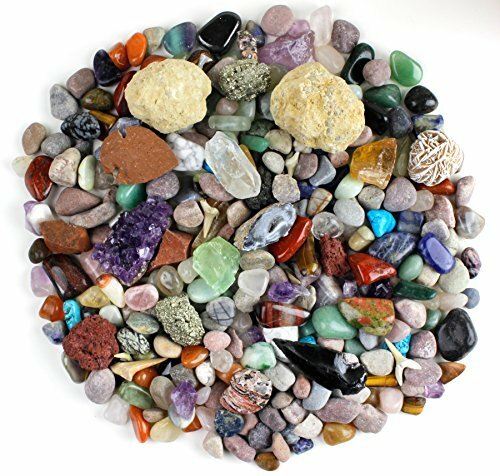 There are over 30 different types including these favorites: amethyst cluster, agate, tiger eye, rose quartz, jasper, quartz point, calcite, turquenite, hematite, pyrite, pumice (floating rock) small geode, and many others. Plus 2 easy-open geodes with crystals inside, fossilized shark teeth and arrowheads! Each kit is assembled in the USA. Buying this kit from Dancing Bear provides skill building and wages to working adults with intellectual and developmental disabilities at the Pearl Buck Center. Dancing Bear is proud to provide our customers with a 100% satisfaction guarantee. If you are not completely satisfied, we will gladly refund your money plus all shipping costs. Fun way for kids to learn about the science of geology. Use a mallet and chisel to dig out gems just like a geologist. 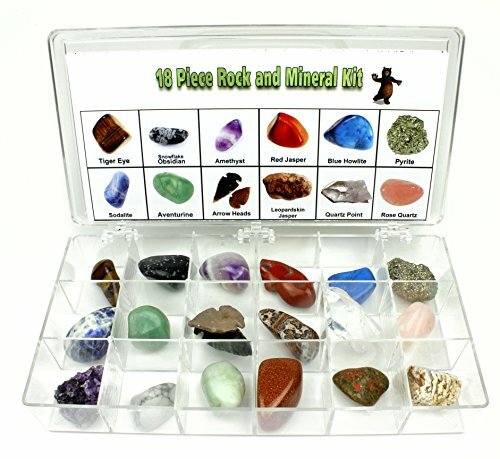 Kit comes with a sand block containing 6 real gemstones and minerals or rocks. 1 chisel dowel,1 mallet, 1 pouch and detailed instructions. 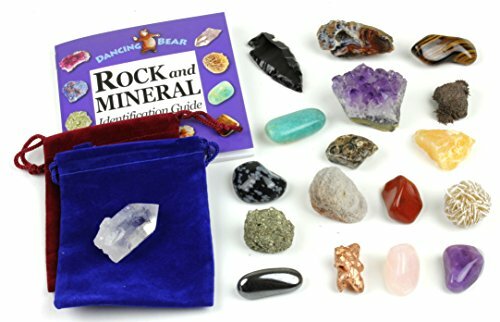 This geology science collection includes:18 gem stones, 27 page Rock & Mineral book, 2 velvet pouches (colors vary), and a box.Teaches how to identify 18 different stones. Each stone is hand picked and is approximately 1 1/4 inches. Examples of stones: Turritella, Amazonite, Aventurine, Tiger eye, Red Tiger eye, Small geode, Leopard skin jasper, Sodalite, Snowflake Obsidian, Gold stone, Blue Howlite, Rose Quartz, Sodalite, Howlite, Amethyst tumbled, Amazonite, Red Jasper, Hematite, Quartz point, Pyrite, Pumice (Floating stone), Lodestone (magnetic! ), Small Geode, Sculptured Copper, Amethyst Cluster, Unakite, Bull's eye Jasper and Arrowhead.Our Rock & Mineral book is full of brilliant photos and interesting facts. It is designed to introduce children of all ages to the wonders of minerals and crystals. Dancing Bear is proud to provide our customers with a 100% satisfaction guarantee. If you are not completely satisfied, we will gladly refund your money plus all shipping costs. Each kit is assembled in the USA.by our dedicated team in Eugene, Oregon. We also donate 10% of our profits to charities. This great collection includes 18 hand picked rocks and minerals that are each approximately 1 ¼ inches in size. This set also comes with a color identification sheet which will help you identify the different rocks and minerals. It also comes with Mohl's hardness scale explaining an identification tool that rock collector's use for identifying rocks. Plus you will receive educational information about each rock and mineral in the set. You will receive the following rocks and minerals: Unakite, Tiger eye, Sodalite, Snowflake Obsidian, Rose Quartz, Aventurine, Amethyst, Quartz Point, Pyrite, Amethyst Cluster, Arrowhead, Red Tiger Eye, Leopard Skin Jasper, Amazonite, small geode, Gold Stone, Howlite, and Blue Howlite. Dancing Bear's Owner has had over 35 years of experience importing and distributing and creating educational rock and mineral sets.Dancing Bear offers a 100% satisfaction guarantee. If you are not completely satisfied, we will gladly refund your money plus all shipping costs. Shipping is fast and ships by Priority mail. Each kit is assembled in the USA. Buying this kit from Dancing Bear provides skill building and wages to working adults with intellectual and developmental disabilities at the Pearl Buck Center in Eugene, Oregon. Get ready to be a Junior Gemologist! Go digging out stone specimen from the earthen block and discover 5 colorful different Rock,Mineral or Crystal.Then,study them with a magnifier and add to their favorite rocks,minerals,and crystal collection. This kit contain:an earthen block, a digging tool,a dusting brush, a magnifier, a wooden hammer and colorized instructions. Perfect for family activity, birthday party project, or homeschool lesson. Compare prices on Gem Kits at ShopPlanetUp.com – use promo codes and coupons for best offers and deals. We work hard to get you amazing deals and collect all available offers online and represent it in one place for the customers. Now our visitors can leverage benefits of big brands and heavy discounts available for that day and for famous brands.